The famous heptagon-shaped building Strykjärnet, (clothes iron). Situated on the tiny islet Laxholmen in Motala Ström, in Norrköping. Built for Holmens Bruk as a cotton mill in 1916. The architect was Folke Bensow. Today it houses the Museum of Work and a restaurant. Oh, and the smokestack in the middle of the stream is an artwork called Den femte skorstenen it was made by Jan Svenungsson. It is a wonderful building! There must have been a reason to put that building in the water. Perhaps to wash the cotton or something like that. As industrial building it looks certainly very good for its age. Yes. The river system Motala Ström is unique in Europe. The flowing water have been used for hundreds of years. 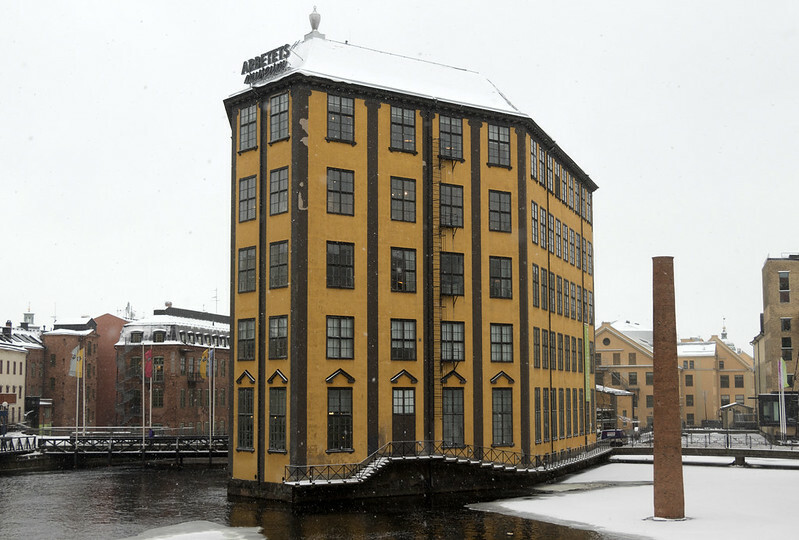 The textile industry bloomed in Norrköping between 1850 and 1920 thanks to the power from the water.